Carl Frampton must fight Cuban Guillermo Rigondeaux by 27 July to avoid being stripped of one of his two world super-bantamweight titles. 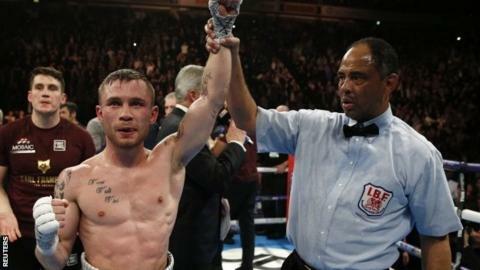 Belfast man Frampton, 28, outpointed Scott Quigg on Saturday to add the WBA world title to his IBF belt. On Wednesday, WBA bosses said that their former champion Rigondeaux, 35, must be Frampton's next opponent. Frampton's manager Barry McGuigan has consistently ruled out the Cuban as a possible opponent for his fighter. "He's amazing on the back foot but he's negative," McGuigan said of Rigondeaux, who fights Briton Jazza Dickens in Liverpool on 12 March. "What do we gain by fighting him?" McGuigan's view is that Rigondeaux, who was stripped of both the WBO and WBA belts last year for inactivity, brings little to the table in terms of television or fan appeal. After Rigondeaux was stripped of the title, the world governing body promoted Quigg from interim WBA super-bantamweight belt holder to champion. However, the WBA have now said that unbeaten Rigondeaux's "impressive record and accomplishments" mean that he must be Frampton's next opponent. The WBA said it was "honoured" to have Frampton as its champion, adding: "We congratulate him on a performance that was as intelligent as it was effective." In spite of the WBA's directive, it is far from certain that Frampton will agree to the Rigondeaux fight, so there appears a strong possibility that the Northern Irishman may give up the WBA belt. After Frampton's win on Saturday, McGuigan said that a contest with Mexico's WBA featherweight champion Leo Santa Cruz was an "obvious fight". Rigondeaux has won all 16 of his professional bouts.